Grapple buckets make it possible to ergonomically move bulky, hard-to-handle materials easily and securely. When it comes to tree removal or clearing land for paving and construction, they are ideal for loading and piling logs, limbs, and brush. The design of the grapple bucket itself allows dirt and sand to fall to the ground while larger pieces of wood, rubble, and debris remain in the bucket. The grapple tines on the end of the bucket curve upward to prevent contents from spilling onto the ground. The curvature of the tines also has another important benefit. It prevents utility lines and cables from being snagged during trash cleanup and tree removal after storms. Grapple buckets are idea for land clearing. Their ability to uproot tree roots that are still in the ground and carry them away helps clear areas around buildings fast and efficiently. They are excellent tools for clearing away debris after demolition work has been done. Excess construction debris can be quickly removed with grapple buckets. In areas where storms have devastated foliage, they are essential tools in the cleanup of storm debris. Grapple buckets are also a vital mainstay of landscaping projects. They are used from everything from clearing out brush to moving earthworks. Easy Rack root grapples and grapple buckets feature a number of benefits that make them dependable, rugged tools for tough construction and cleanup operations. For one thing, they are designed with hydraulic cylinders that allows the bucket to flexibility adjust itself to the diameter, circumference, and unequal weight distribution of cumbersome and uneven loads. This prevents the unit from becoming top- heavy and creating a safety hazard, and it helps extend the life of the unit. To further minimize wear and tear on the grapple bucket, hydraulic cylinders, hoses, and fittings are protected with covers. All pivot points are lubricated with grease zerks to maintain flexibility and avoid stress to moving parts. To accommodate an optional bolt-on-blade, cutting edges are punched so the blade can be fitted securely to the grapple bucket. Additional tines can be added if the space between existing tines is too small. This is often done when moving piles of rubble or in landscaping work where a large amount of leaves, twigs, and other small trash items have to gripped firmly to avoid spillage. If you are fitting a grapple bucket to a “track” style skid steer, 70hp or greater skid steer, or skid steer rated at or above 3,500 lbs., we recommend you invest in a demolition grade unit. Demolition grade units feature cylinder hoses routed in an enclosed tube. This built-in covering provides much needed heavy duty protection for fittings in heavy industrial applications. Demolition grade units offer larger capacity for uneven and extremely heavy loads with reinforcement gussets, and reliable performance is ensured by heavier component manufacture throughout. Grapples on these buckets open wide for full loads. The bottom of the bucket is reinforced by steel plate ribs measuring ½” thick. 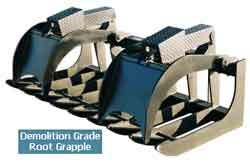 Additional options for demolition grade grapple buckets include end plates that contain loose materials and raised rings that protect grease fittings from damage. Ask your account manager about which of these options is best for your next project.